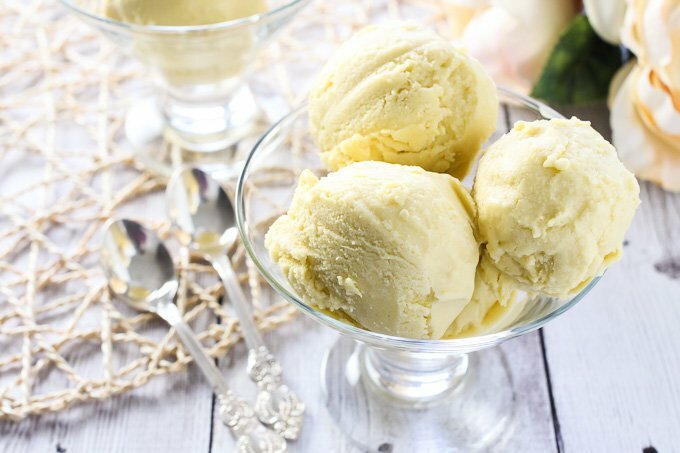 This vegan mango ice cream is made without an ice cream maker using an easy no churn method. It’s so smooth and silky that you won’t believe it was made without any eggs or dairy. I really like ice cream but can’t have much of the store-bought kind because it usually contains too much sugar. Even the healthier ice cream is still too sweet for me. Also, I don’t like to eat dairy with processed sugar because it pretty much guarantees me a blood sugar crash. 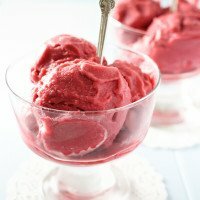 So, for myself and for my friends here on the blog who prefer dairy-free food, I decided to make a vegan ice cream recipe. 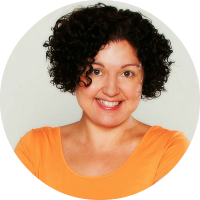 But first, let me tell you about my No-Churn Ice Cream Method. 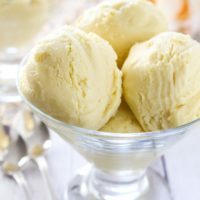 I don’t have an ice cream maker, so I really wanted to develop a better method for making ice cream without a machine. 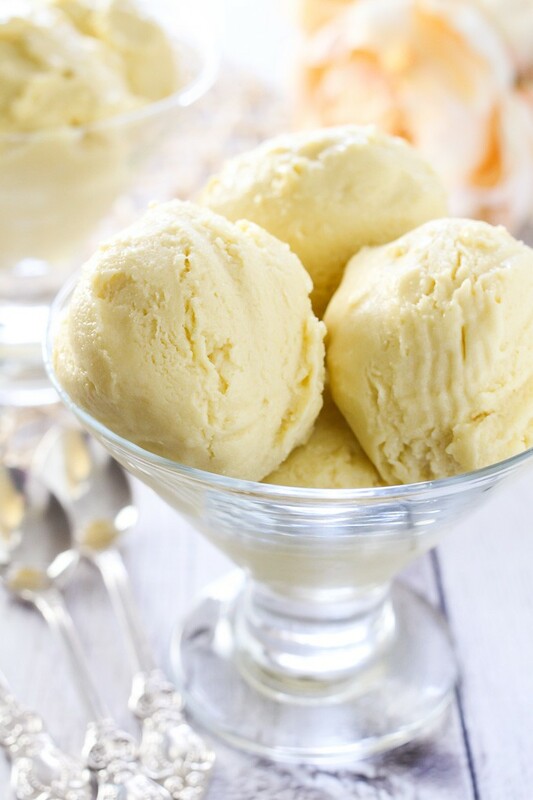 The usual instructions for making ice cream without an ice cream maker tell you to place the ice cream in the freezer and then churn it every hour to make sure that it freezes evenly without any ice crystals. And the worst part was – the next day it was frozen solid. There was absolutely no way for me to break off a piece. I left the ice cream out on the counter for about 30 minutes hoping it would get softer. As a result, the ice cream melted at the edges and the middle remained completely frozen. After all of that effort, ice cream making didn’t seem like fun anymore. I am sure this method works for ice cream made with high-fat dairy and sugar because both of these ingredients would prevent the ice cream from freezing completely. However, this method doesn’t work for my dairy-free recipe. I didn’t want to give up, and after a few experiments, I decided to try freezing the ice cream in a muffin pan, and it worked! This way the ice cream freezes much faster and is easy to store. 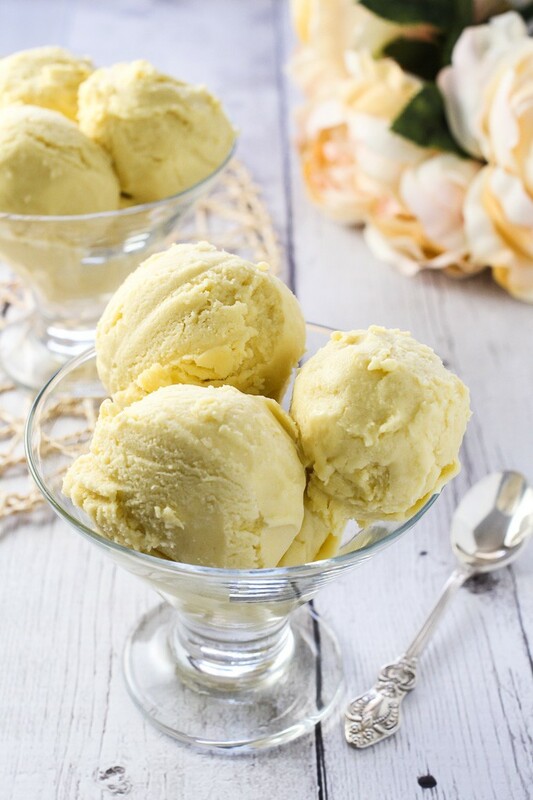 And once you are ready to serve it, you can just take out as many ice cream cups as you like, quickly process them in a food processor, and you’ll have a smooth and silky vegan mango ice cream ready to enjoy. I am sure this method will also work for other ice cream recipes. Please let me know if you try it. Step 1. 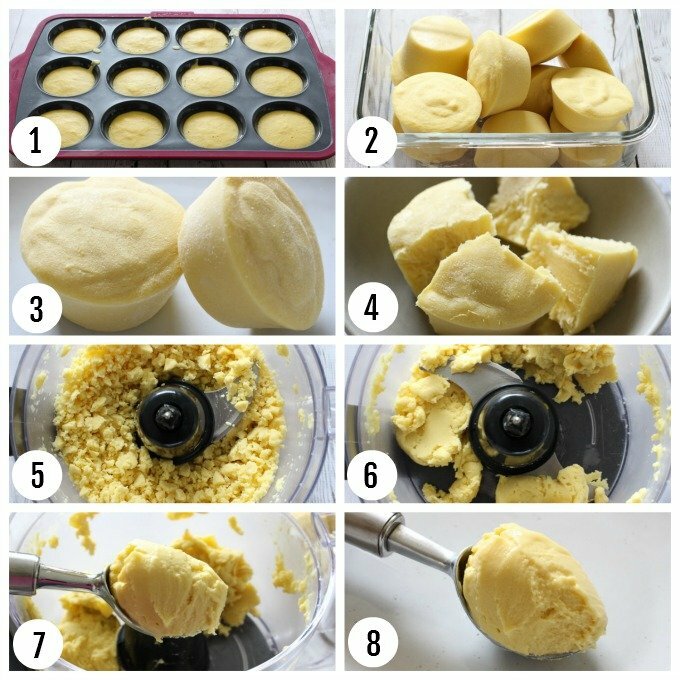 Divide the mango ice cream mixture equally among the 12 muffin cups. Place the muffin pan into the freezer and let the ice cream freeze for about 3 hours or until completely frozen (depends on the temperature of your freezer). You can leave it in there for a longer period, for example, overnight. Step 2. Once the mango ice cream is frozen, pop the ice cream cups out of the muffin pan and transfer them to a glass container or a plastic bag. I have a silicon muffin pan, so they just pop out. 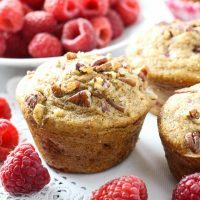 If you have a regular muffin pan, you can fill the sink with a little bit of warm water and place the bottom of the pan into the water for a few seconds. The ice cream cups should easily slide out of the pan. To store the ice cream, cover the glass container with a tight lid or seal the plastic bag and place in the freezer. Step 3. Once ready to serve, take the mango ice cream cups out of the freezer. I find that one cup is equal to one large scoop of ice cream, so I serve about two per portion. Step 4. Depending on your food processor, you might want to break the cups before you process them. My food processor is not very powerful and wouldn’t process a whole ice cream cup, so I just break them up with a sharp knife. Step 5. Place the mango ice cream chunks into a food processor and start processing them. First, you will notice that the mixture falls apart into crumbs and you will seriously doubt that this could ever become ice cream. Step 6. Just keep processing it and all of a sudden you will see that the crumbs stick together and magically turn into a soft mango ice cream. Step 7. At this point, just scoop the ice cream. Do not replace arrowroot powder with cornstarch. 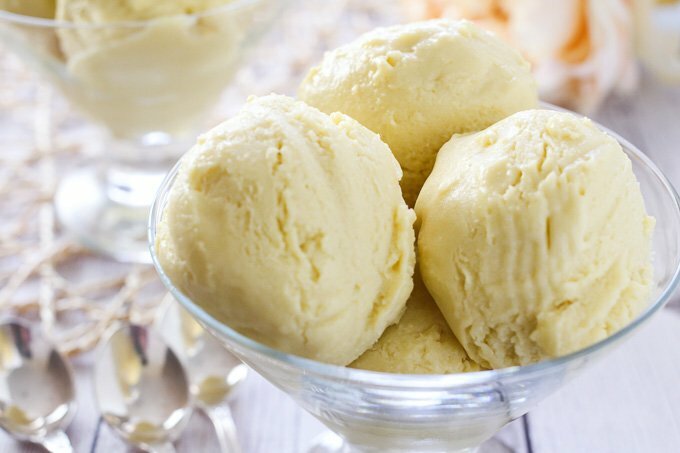 Cornstarch is a more processed ingredient, and your ice cream won’t be as smooth and silky. Make sure to puree mango until the fibers are broken down and the puree is completely smooth. 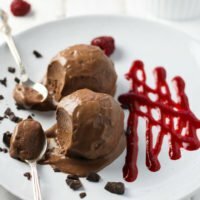 If you are looking for more vegan ice cream ideas, check out this No Churn Vegan Chocolate Ice Cream and this No Churn Vegan Raspberry Ice Cream. 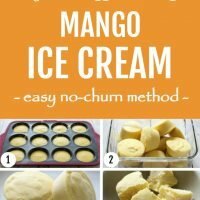 No Churn Vegan Mango Ice Cream recipe and instructions on how to make ice cream without an ice cream maker. Pour all contents from the coconut milk can into a medium pot. Place 3 to 4 tablespoons of the coconut milk liquid into a small bowl (sometimes there will be solid and liquid coconut milk in a can depending on the quality of the coconut milk and the room or storage temperature). Add 1 tablespoon of the arrowroot powder into the bowl and whisk until fully smooth. Place the pot with the coconut milk on the stove and start warming it up over medium heat. Once the solid parts of the coconut milk dissolved and the coconut milk became fully liquid, slowly pour the arrowroot mixture into the coconut milk making sure to constantly whisk. You will notice that as you warm it up, the coconut milk will become thicker. 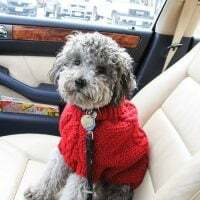 It is very important not to overheat it – do not bring it to a boil or simmer because if overheated the arrowroot powder will lose its thickening ability. Once the coconut milk is hot take it off the heat and let it cool a bit. In the meantime prepare the mango puree. I prefer to thaw the mango chunks a bit before processing them. I find it’s easier to process them to a very smooth puree when they are a bit softer and not fully frozen. But it also depends on your food processor as some are more powerful than others. Mangoes have very tough fibers so process the mango chunks until the fibers are fully broken for about 3 minutes. Once the coconut milk is room temperature, add the maple syrup and vanilla extract and stir to combine. Add the coconut milk mixture to the mango puree in the food processor and process some more until fully smooth. 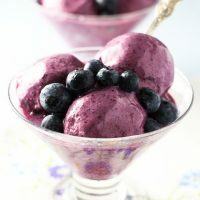 Once ready to serve, place the ice cream cups into a food processor (break them up with a knife if needed before placing them into a food processor) and process until soft ice cream consistency. Scoop into bowls and serve. I was graving vegan ice cream for soooo long !! This look delicious 🙂 I just want to know with what I can substitute the arrowroot powder with? Hi Maina! 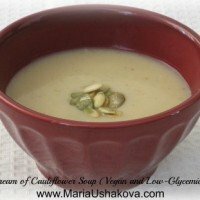 I only tested this recipe with arrowroot powder. You could try tapioca starch but I don’t know if it will work or not. I love this ice cream! Would this work with strawberries? Hi there! The method would work for any ice cream recipe. 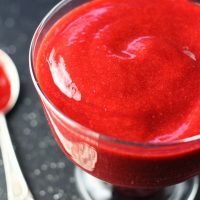 If you want to replace the mango with strawberries, you would probably need to add more sweetener as strawberries are usually less sweet than mango. YUM! Mango has been a total food obsession for the last few months. Aaaaaand since I don’t have an ice cream maker, this is perfect!